Gone are the days that companies could say, “Our company has an awesome culture,” and job candidates would just accept this with rose-colored glasses. Potential employees want the real story — the good, the bad, and the ugly. Your job candidates are using Glassdoor to learn this very thing. The platform allows actual employees to rate their employer on a variety of features, including culture, career opportunities, and senior leadership, and share candid feedback on their work experience. Your company brand is left out in the open for everyone to read about. And if your scores look bad, then recruiting top talent is going to be that much harder. We compiled data on all organizations with Glassdoor ratings and segmented them by organizations that do and do not use TINYpulse. The differences in Glassdoor scores were astounding! Across each and every dimension that users can rate, organizations that use TINYpulse enjoyed significantly higher scores (p < .001 for all ratings). That means that scores around culture and values, senior leadership, compensation and benefits, career opportunities, work-life balance, likelihood to recommend to a friend, and, of course, the overall score were systematically better for TINYpulse users. And the differences don’t stop there. 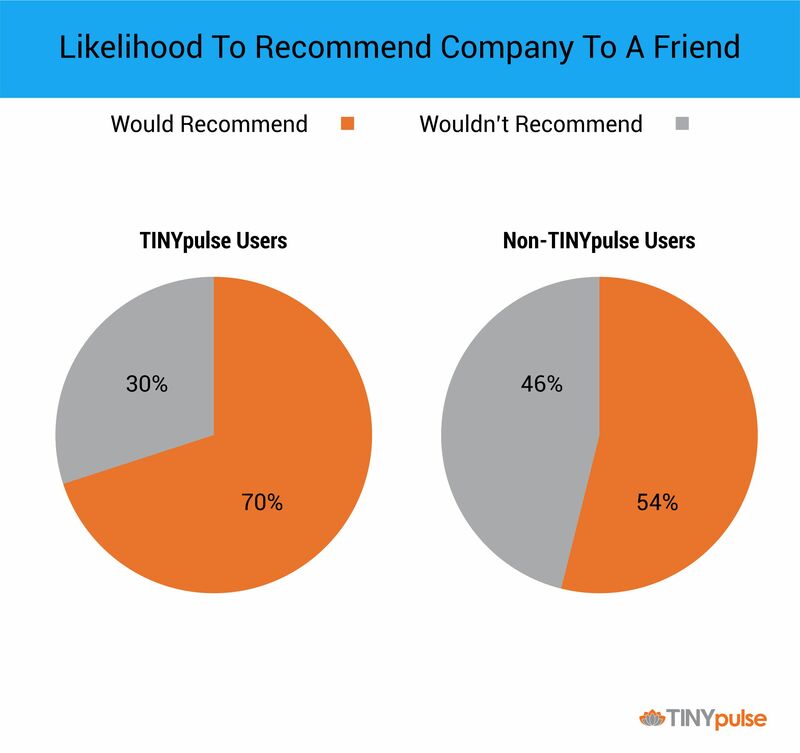 70% of employees that are TINYpulsed report that they would recommend their organization to a friend, a far cry from just 54% of non-TINYpulse using employees. 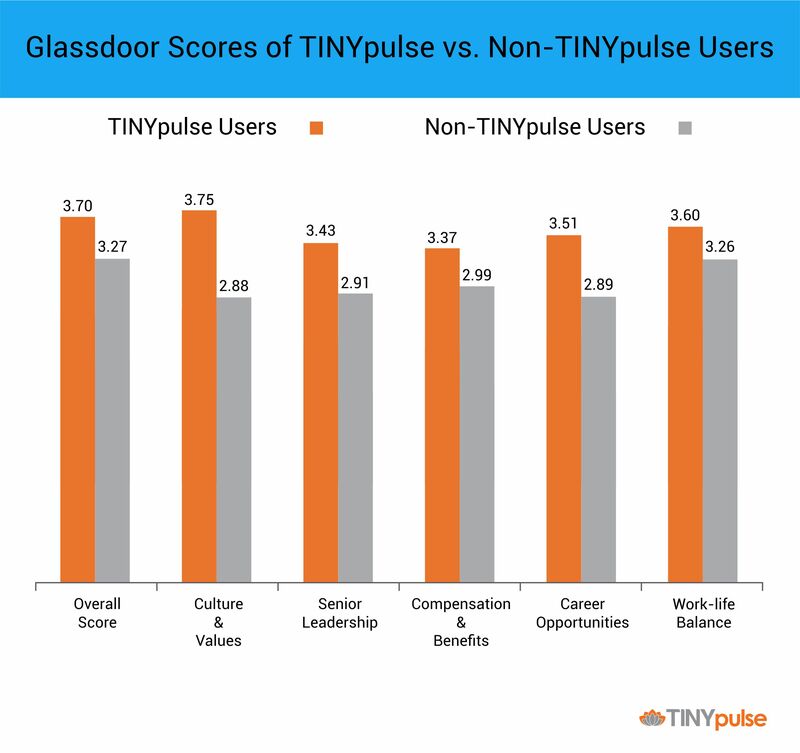 Why such consistently different and positive Glassdoor scores for TINYpulse-using organizations? TINYpulse helps encourage open, transparent cultures by fostering dialogue and allowing employees to share what’s really on their minds. As a result, it gives leaders the actionable feedback they need to build robust work cultures that help boost Glassdoor scores far above the competition.